The first thing that I noticed about ‘Woodland’ Beard Wash from Mr Bear Family, is the pump dispenser on the bottle and I think it’s a nice addition to a product! Whenever I use a beard wash in the shower, I also use it on my head. Personally I can’t see the point in using two different products and the beard washes/shampoos are generally made from natural ingredients. ‘Woodland’ Beard Wash from Mr Bear Family which is based on tensides of vegetable origin, lathered up quite well and that’s saying something in the hard Essex tap water. A fresh woody and green smelling wash that left my beard feeling fresh and clean using just a few pumps of the dispenser. I have sensitive skin and I had no reaction to using this Beard wash! This wash has anti-inflammatory properties and is great for helping to moisturise your skin. 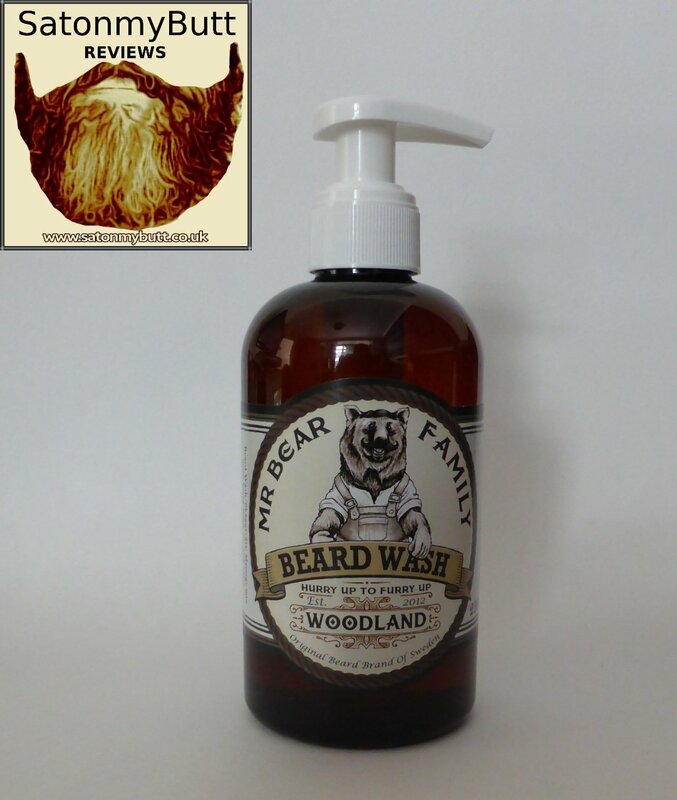 ‘Woodland’ Beard Wash from Mr Bear Family comes in a plastic 250ml bottle with the pump dispenser. The wash is a clear liquid that has a syrup like thickness (without the Stickiness) and has that fresh woodland scent. Priced at 259.00 kr on the Mr Bear Family Website which at today’s exchange rates is £23.46 GBP. A really nice beard wash, great scent and does exactly what its meant to, nice job! The founder, Björn Landén let his moustache grow and quickly he realized that, when there is more food in the moustache than on the plate, there must be something that can prevent this? Björn came to the conclusion that it was difficult to find great products to tame the whiskers. He simply decided to make his own moustache wax and so he pulled out the copper pot at home in the kitchen, and on that way it goes. The moustache grew and became a beard, and so did the product range and all the hairy friends. Eventually, all became one big family. Mr Bear Family is Sweden´s first manufacturer of moustache and beard products for men in modern time. In making the products, we only use natural ingredients. The concept is to produce all-natural products without using chemicals additives or artificial mineral oils such as petrolatum (vaselin). We strongly reject all forms of tests on animals. We hope you enjoy the products and want to become a part of our Family! The Mr Bear Family Crew.